Here is a telecom enclosure used for mobile phone network outstations. 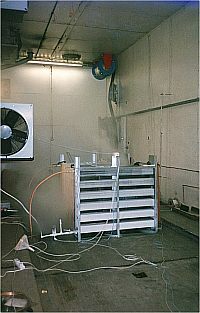 In the test, the enclosure had to maintain internal conditions under maximum load and subjected to high temperature and solar loading. Oil and hydraulic systems become more viscous at low temperature. Manufacturers use CRT test facilities to determine if the machinery will start and to check that hydraulic pressures are within margins. Refrigeration absorption systems have to work in low ambient to provide cooling, as heat flow is often required from specific areas. This was such low temperature test. A mobile dive decompression chamber tested by CRT for the UK Ministry of Defence. This was a prototype enclosure for operation in the desert. Its function is to provide a stable temperature enclosure for switchgear and works by using eutectic wax and heat pipes. 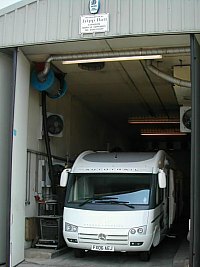 Motor trailers have to meet EN1646-1 for heating and cooling, a series of tests ere carried out on motor homes to confirm this. Even prison vans are tested to determine their capability to maintain a satisfactory environment inside.